If you’re a Christian, there’s not one reason that you shouldn’t sing and be happy, today, and every day! The promise of eternal life in heaven with God our Father and our Lord Jesus Christ, should override every care and concern that we might have in this life. Just look at the unspeakable joy on the face of the young woman in the picture at the top of this page! 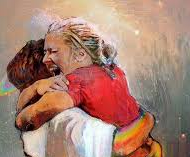 That’s a picture of a painting, called “First Day In Heaven”, where the woman throws her arms around her Lord Jesus! That’s just one woman’s perception of what the first day in heaven will feel like. I’m sure that you’ve got your own perception of what it might feel like. But whatever you’re perception is, I’m sure it’s better than words can describe! Let me read to you from Ecclesiastes 1:4 thru 9; “A generation goes, and a generation comes, but the earth remains forever. Also, the sun rises, and the sun sets, and then hastens to where it arose.” It’s all just a seemingly endless cycle now. “All the rivers flow to the sea, yet the sea is not full. To the place from where the rivers come, there they return again.” A seemingly endless cycle, but nothing new. “Thus says the Lord.. in (Isaiah 66:1) ..Heaven is My throne, and the earth is My footstool. Where then is a house you could build for Me? And where then, is the place of My rest?” God’s place of rest, His dwelling place, is heaven. It’s the “place” of eternal day! And so God dwells in eternity, and he waits! And do you know what He’s waiting for? He’s waiting for you, and for me. Because as we read, in Hebrews 4, verse 9; “There remains therefore, a “sabbatismos” for the people of God.” Sab-bat-is-mos’.. that’s the Greek word, that’s used only this one time in the entire bible. And it refers to eternity. It means.. “an eternal rest from our labors”. We’ll all be made complete, together, when we enter the eternal dwelling place of God. And THAT, is what should make us so happy, and so glad, every day of our lives! And that thought should override any and every grief that this life can bring us. It really should. Nothing can compare to the joy of entering His rest! We should sing, and be happy, every day of our lives, KNOWING what lies ahead! Lift your voice and praise Him in song! Sing and be happy today! Just like the song says. Look again at that picture at the top of the page.. “First Day In Heaven”! Look at how that artist has painted the face of that young woman. There’s no words for that. The feeling in your spirit, when you see Jesus will be more than words can describe. I don’t know if we’ll be able to wrap our arms around Jesus, or if He’ll be able to wrap His arms around us; But I’m sure there’ll be an embracing. It wouldn’t be a physical embracing, but somehow there will surely be a spiritual embracing. God the Father, and Jesus Christ, embracing us, for our faith in Him, and saying to us; “Well done, good and faithful servant.. ENTER into the joy of your Lord!” (Mathew 25, verse 21) Enter My rest! And you can shout, and you can sing, and you can cry, and you can raise your voice and you can praise God! And you can do it forever, because that day will never end. The work will have ceased, and the wait will be over, and the joy will begin. Repentance means that you turn from your sin, and turn again to God. “Repent therefore, and return! that your sins may be wiped away, in order that times of refreshing may come form the presence of the Lord.” (Acts 3:19) You won’t be able to have your sins forgiven, unless you first repent. One final step.. “And now, why do you delay? Arise and be baptized, and wash away your sins, calling on His name.” (Acts 22:16) The word “baptize” means.. “to immerse”. Baptism is an immersion in water, and it’s a “burial” of our old self, the one that was a slave to sin. And it is a “resurrection” and “new birth”, that we should now put away all sin, and follow Christ. Our baptism perfectly emulates the death, burial, and resurrection of Jesus Christ. And now, Rejoice! You’re a Christian! “Raise your voice and praise Him in song. Sing and be happy today! Your rest awaits you, your eternal day awaits you, and your God awaits you! Would you open your hymn books up again to # 482.. The invitation is yours to obey the gospel of Jesus Christ, today, as we stand, and as we sing. And please, don’t be afraid to raise our voice to God. ← How Can We Truly Serve God ?